There are always people above me. As of this second, which finds me at a table in the basement where I write books or don’t write books, depending on the relative shittiness of my resolve that day or depending on the gods or on whoever or whatever is to blame for my failings, the people above me are my wife and son, still asleep upstairs. I got up in the four o’clock hour and have been doing so for a while to try to write my book before I go to work. As I write I brace myself for sounds of wakefulness above me. Sometimes it stays quiet for a while and I can get some words down. Other times it stays quiet for a while and I waste the time Googling Eugenio Velez. Eugenio Velez is still active in Triple A baseball, which means he has the chance to return to the major leagues and put a stop to his major league hitless at-bat streak, which currently stands at 46 at-bats in a row without a hit, the all-time record for non-pitchers. I don’t want to miss his call-up to the majors, even though it seems increasingly unlikely that such a call-up will come. There are always people above him. In a short while, I’ll go to work, where the people above me are supervisors and middle managers and directors and vice presidents. I sometimes pass one or another of these personages as we are wending our respective way through the pasteboard cubicle maze. They are outwardly no different from me, especially in the preference to avoid eye contact while afoot within the maze. They are outwardly no happier or secure than me. There are people above them, too. This means, this always means, that decisions could be made somewhere, somewhere above, that result in things ending, by which I mean paycheck, insurance, etc. This would be terrible. I dread it, the possibility of it. Sometimes it makes me angry that there are people above me, always, always the possibility that a decision will be made above me to send me packing. So I go to work, work all day, do what I can. I come home. My son, almost two, now runs at me when I come home. Not to me but at me. We go down to the basement. He likes it down there. It’s carpeted, i.e., a softer landing spot for falling, and there are baseball cards and balls and my old guitar, which he likes to strum. Sometimes down there he orders me to participate in one or another of his rudimentary games. He’s above me, the one true boss of my life, so I have to comply. Other times he gets interested, inexplicably, in some random task that happens to be more solitary, such as dropping a pair of earphone buds again and again into the binder of a photo album jutting out from the bookcase. 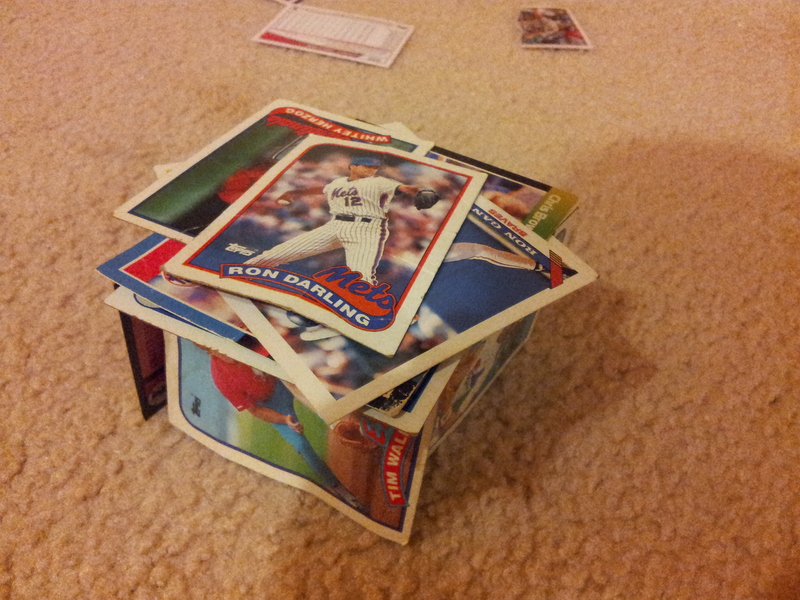 In those rare instances I either lie on the ground, exhausted, or, if I have some shred of life still in me, I fiddle around with his baseball cards, which are usually strewn all over the floor. Lately I’ve been building little houses of the cards. They don’t last long, these houses, because a certain party eventually gets interested and, even if he initially contributes to the house by laying a Dennis Rasmussen or Mike Proly on the roof, inevitably gives in to the joy of demolition. But I managed to get a picture of one of the houses before it was destroyed. It would be nice to live in such a house forever, I sometimes think. To look up and see nothing above you but numbers, knowable and distinct. Maybe there’d be a faint scent of gum. You are currently browsing the archives for the Ron Darling category.